How does anyone balance managing the day-to-day operations of an entire company’s property management portfolio, lead a team of more than 125 employees, help raise three children, and complete a strenuous course schedule to earn a Certified Property Manager (CPM) credential from the Institute of Real Estate Management (IREM)? 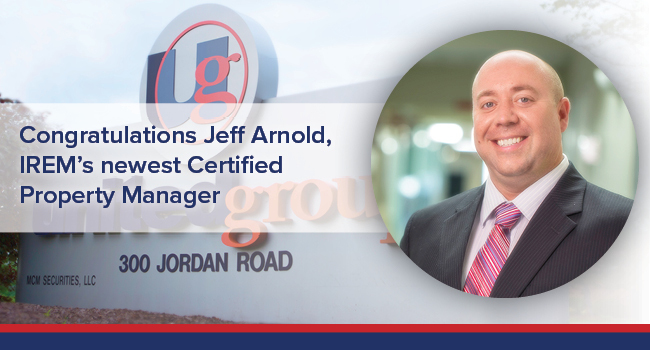 For Jeff Arnold, Chief Operating Officer of United Realty Management Corporation, it’s all in a day’s work. Arnold, a native of Houston, TX, spent more than twelve months studying and completing a taxing schedule of coursework and exams to obtain the prominent Certified Property Management (CPM) credential from the Institute of Real Estate Management (IREM). IREM, an affiliate of the National Association of REALTORS, is recognized around the world as a community of devoted real estate mangers dedicated to ethical business practices, maximizing real estate investments, and promoting innovative management techniques. “It’s a privilege to join such an esteemed organization, and I’m thankful to Michael Uccellini for sponsoring my candidacy to become a member of IREM and earn my CPM,” said Arnold. To qualify for an IREM membership, a potential candidate must be sponsored by a current Certified Property Manager. Michael J. Uccellini, President and CEO of United Group of Companies, Inc. who also serves as IREM’s President of New York Capital Region Chapter No. 93 sponsored Arnold. Arnold plans to apply the valuable practices he learned from the IREM coursework into everyday work strategies. He currently provides the direction of operations across all of the property management portfolios, including student, senior and multi-family housing, as well as commercial and mixed-use developments.